A groundhog sees his shadow and we’re told to wait for winter to pass us by yet again. However, the winter of 2017-2018 has been no picnic for many people. Several states saw extended record low freezing temperatures. The demand for frost heave repair will rise as a result. Landscapers, contractors, outdoor property management companies, and municipalities will find themselves dealing with the cold hard facts; frost heave and cold weather damages are everywhere. Frost heave happens when the stones that are part of the walkway begin to heave (or shift) after freezing weather. This is a result of the joint sand underneath the stones settling unevenly after freezing and thawing out. What Kind Of Walkways Are Most Affected? 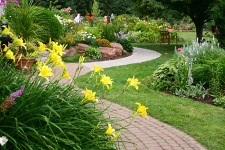 The most affected types of walkways are paver, concrete, and flagstone (natural stone) walkways. These types of walkways typically must be deiced during winter. 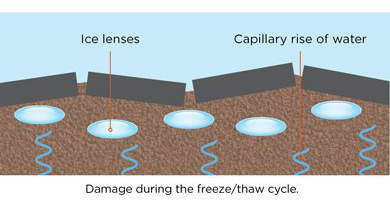 Occasionally, due to severe conditions, frost heave repair is also required. What Causes Frost Heave Damage? Paver and stone walkways could crack if they’re old or of poor quality. Joint sand underneath walkways can settle unevenly. If you use the wrong type of bulk salt to remove the ice, your slabs can be damaged. The end results are: dangerous and ugly cracks in the concrete or flagstone. 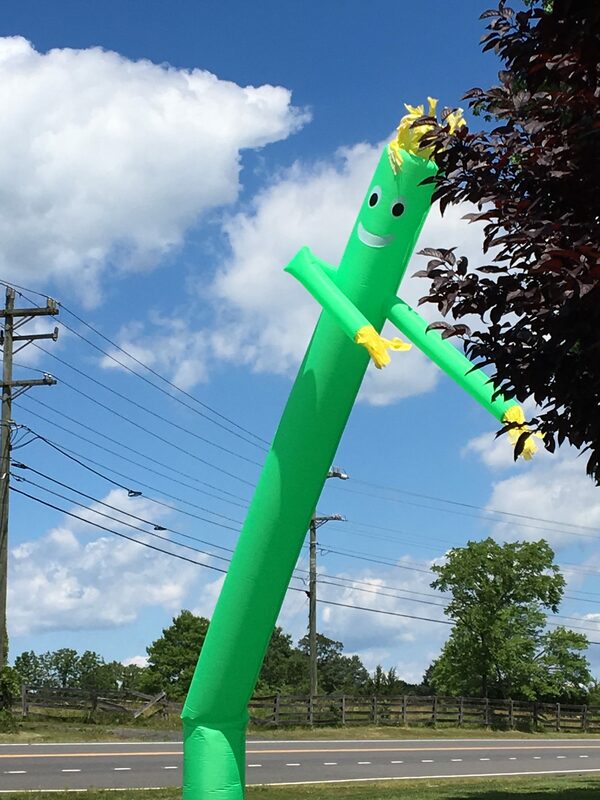 This will make your patio and/or driveway unsafe and unsightly. And, if these cracks aren’t taken care of right away, moisture will seep into them and make the concrete slabs vulnerable to heaving. One solution to the loose flagstones and slabs is to simply remove them. You’ll also have to remove any old cement underneath them. 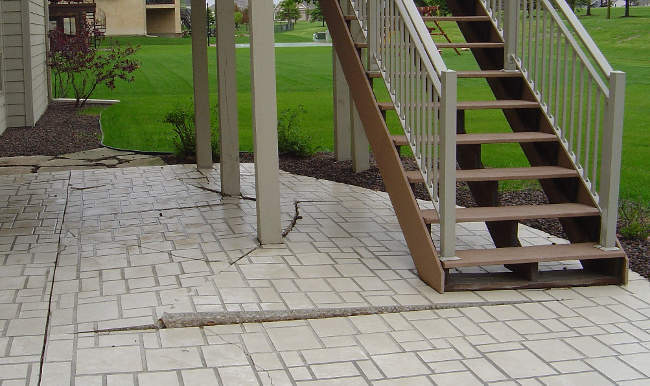 If you notice any long cracks running from one section of your patio or walkway to another section, then read on to learn more about paver patio repair. This is a clear indication that your foundation also has some serious cracking. Widen any crack in the foundation to about a full inch in width. The widened crack will then be filled with a masonry adhesive agent. This must be given enough time to setup. Bonding agent added to mortar mix will be used to fill the crack. You may also choose to add steel reinforcements along the crack area. Flagstone walkways are generally less affected. They are well known for their immense durability. However, they can still get damaged during extremely cold weather, or if something heavy falls on them. Fortunately, removal of the damaged stone and replacement with a new one usually completes the repair. 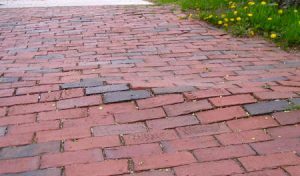 Paver walkway repair is more time consuming and requires paver removal, subsurface layer repair, and replacement of pavers. In some cases new pavers are needed if frost heave has caused uneven wear or paver deterioration. With less durable concrete walkways however, frost heave repair isn’t as simple. You should consult with an expert mason to examine your walkway and see if there’s any serious damage to the foundation. Summer isn’t the best time to undertake plant relocation. The heat and sun angle are not plant friendly. However, there are times when the only option is to perform plant relocation during the summer. You can have success with plant relocation during any season by following these easy guidelines. Water the plants to be dug and relocated at least a day before you plan to move them. This will make certain that hydration will reach all areas of the plant prior to the start of relocation. Dig and relocate only during cloudy days or in the evening when it is cooler. Prior to digging or removing the plant from its current location, be sure to water the base liberally. This will ensure that the soil will stay with the roots when it is removed from its current location. Do not expose the roots during plant relocation to wind, heat or sun. If relocating multiple plants, only work with one plant at a time. Do not remove multiple plants from their current location at the same time. Water the intended plant relocation hole before moving. Put the relocated plant into the hole and pour water in until reaching half way point of the hole. The water will merge the root soil and the hole soil. After soak, finish filling hole with soil. 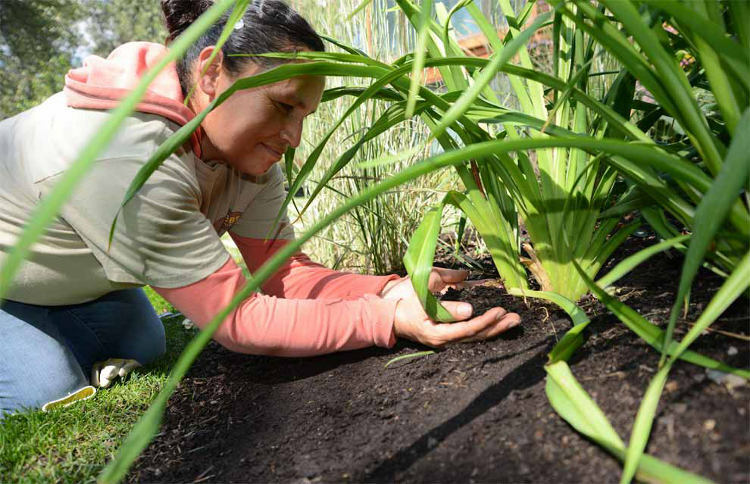 Once the plant relocation is complete, you can tamp the soil but do so lightly. After the plant relocation is in place, water the entire plant again including the leaves. Keep the plant shielded from direct sunlight. A floating row cover or leaning a board between the plant and the direction of sun will work nicely. Do this step for 3-6 days. Be sure to check on the plant relocation site every day for 2 weeks. Relocated plants will need watering at least once every day. If the plant is wilting give it water. Keep water the plant once or twice each day until it becomes established. If the plant has less roots than top growth or is very large, it will need more water. This may seem to be an inordinate amount of attention, but the disturbance of being relocated is stressful to plants at any season. 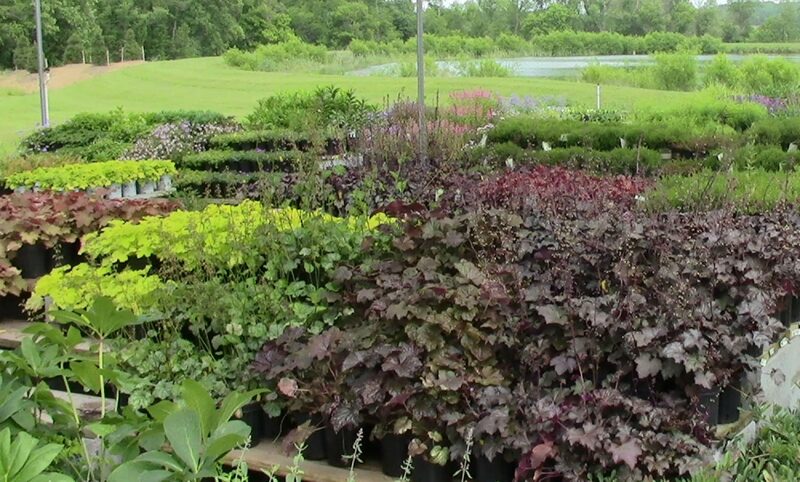 During the summer, taking extra caution is important to allow for the transition of your relocated plants. Does landscaping increase property value? If horticultural studies are anything to go by, there can be as much as a 12% increase in property value from landscaping alone. The value in a pleasing landscape is obvious. 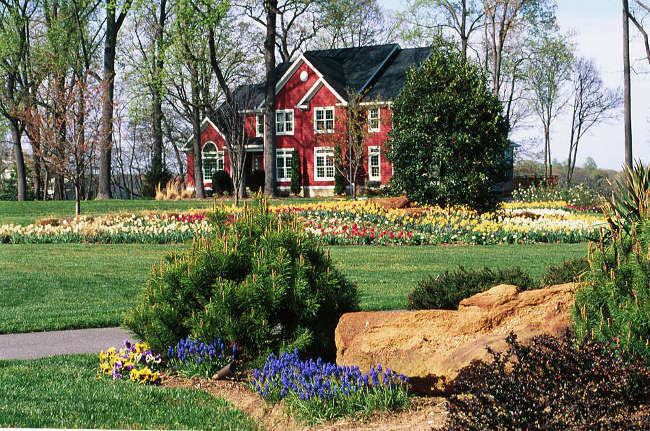 People want a weed-free lawn and attractive flower beds. When they host a family barbecue, they want to be proud and not embarrassed. The first thing that buyers will see is the outside of your house, so it must look as good as possible. Remember, a home that has a well maintained yard signals to buyers that the inside of the home is well maintained too. To increase landscape property value and attract buyers, it is crucial to have a good landscaping plan in place before you do any actual landscaping. If you make landscaping decisions without looking at and knowing the big picture, the landscape will likely appear disorganized in the end, which will turn off prospective buyers. 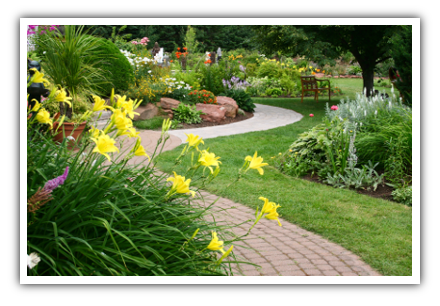 A professional landscaper can provide you with clever designs that are suitable for your yard and climate. If you don’t want to hire a professional, at least start by drawing up a master plan for the landscaping project and commit to small chunks each season. Even if you are an amateur, you can create a professional landscape for around $500 – $3000. Price factors include which landscaping company you choose as well as the plants and materials for the project. Speaking of plants, natural plants are worth the effort of planting. Native plants usually grow better than foreign, exotic plants. Healthy plants don’t need replacing as much, so you can save a lot of money as plants can be expensive. The higher price you pay for plants is reasonable because landscaping will increase property value right away, and it is truly one of the few improvements that can do this. And the value will also increase over time; interior design and decor can go out of style, mechanical systems can wear out, but plants will grow and improve each year. Finally, in case you aren’t experienced with gardening, gardening is fun and relaxing. It has been shown in studies to be a stress reliever. Therefore you will gain in health as well as increase your landscape property value. Do not let nature take its course. Do proper maintenance on the plants – they will be healthier and prettier. The longevity of plants is a result of their health. Their roots must be healthy and unconfined. If there is a problem with the roots the plants will eventually show it. When a shrub gets too big and bushy on the outside, the inside of the plant suffers, so make sure to keep them pruned. Hydrangeas are strikingly beautiful flowers, and with minimal effort they can take care of themselves. 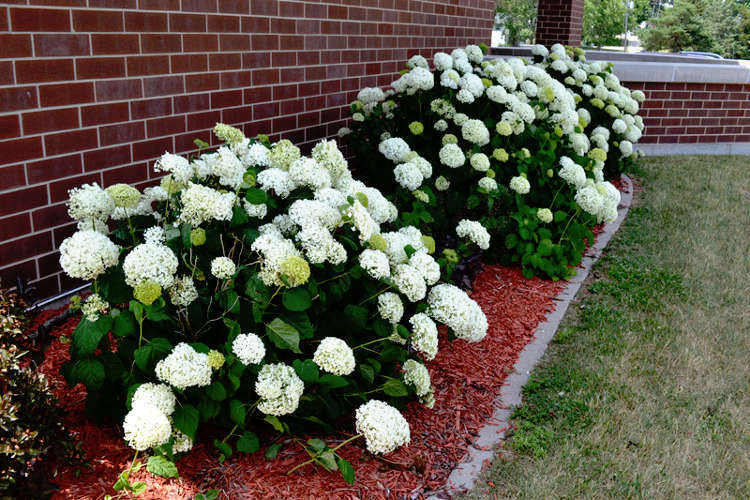 However, if there are any dead or faded flowers or stems, you may need to start pruning your hydrangeas. This should be done immediately. There are two ways to go about pruning hydrangea. That’s because there are two types of hydrangeas: old wood hydrangea and new wood hydrangea. If you aren’t sure which type you have, you can check the plant label if you have it. If you don’t have it, you can still look at the leaves. In this article we will go into more detail on how you can check which type of hydrangea you have and how to start pruning hydrangea of either type. Old wood hydrangea includes mophead, lacecap and oakleaf flowers. This type of hydrangea is referred to as old wood because they have flowers that bloom on old wood. The term old wood refers to last year’s growth, which means that the buds are set in the fall and are projected to bloom in the spring. Mophead and lacecap have serrated dark green leaves. Oakleaf, as you would expect, are just like oakleaves and they turn red in the fall. Old wood hydrangeas are from the Macrophylla family. These include Nikko Blue, Endless Summer and several other blue and pink flowers. It’s more important to know when not to be pruning hydrangea of this kind. Don’t prune these after August or you might prune away next year’s flowers. Before August you can cut flowers with long stems for floral arrangements. After August you can cut off flowers with short stems to avoid losing buds that will bloom the following year. New Wood flowers include Annabelle and Paniculata Grandiflora (PG) flowers. These are usually white flowers (white can sometimes indicate oakleaf however). Annabelle flowers have leaves that are a fuzzy gray underneath. When should you start pruning hydrangea of this kind? You can prune these flowers anytime except during the spring (unless it’s early spring), when buds are being set to bloom in the summer. After they have reached three years of age, come winter you can prune them almost until they’ve reached the ground and they will still come back next year. Once a shrub has matured you should cut the stem back by 1/3 each year to make the plant stronger. Hydrangeas thrive in sunny mornings and shady afternoons. They won’t do well in the shade. They want lots of moisture and need extra watering during the first and second year after being planted, particularly during drought seasons. 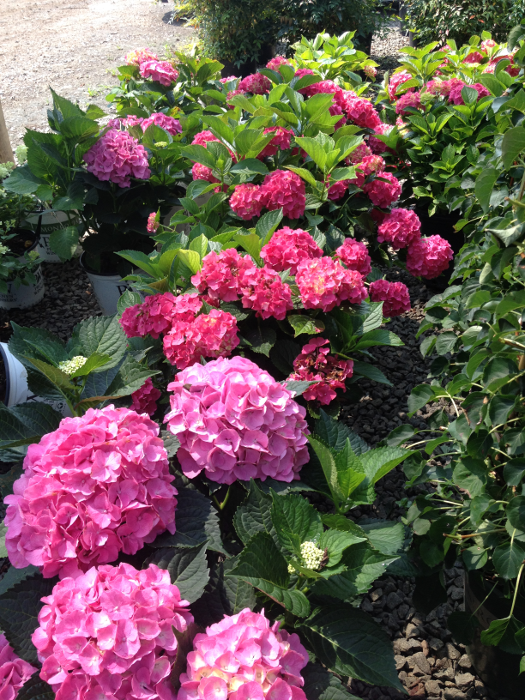 Hydrangeas prefer following a fertilization schedule. Follow guidelines and instructions on the fertilizer label. <<< You can still grab our Info Guide Here. 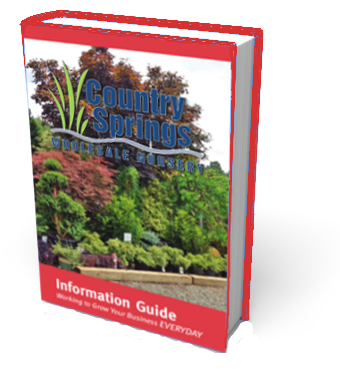 It has great information about hydrangeas and many other plants. 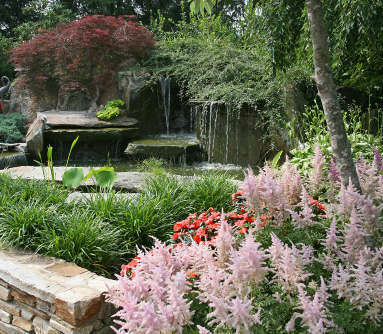 For most landscapers, summer means heat, drought and watering needs. 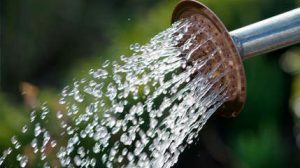 This can be especially difficult for landscapers that need to rely on home owners without irrigation systems. The good news is that there are ways to assist plants and allow them to thrive despite these seasonal challenges. Adjusting summer landscape care accordingly during the hot months can not only provide relief for lawns and gardens, but also for the landscaper. 1. Monitor soil moisture. Provide supplemental watering and/or increase watering times on your drip irrigation system during hot, dry periods. Watch for pests and manage them accordingly. Many insects will attack plants when they are under stress from drought. 2. Assess which of your plants are under stress from the heat. Consider moving plants that prefer more moisture and shade to a different, more shady location so they will grow better next year. However, don’t do any transplanting now, wait until late August at the earliest. 3. Staking gladiolus, dahlias, crocosmia, and other lanky perennials is important to prevent stem breakage and enhance the flower display. The choices of staking materials run the gamut, from bamboo stakes and tobacco sticks to hardware cloth and rebar. Rebar, commonly used in home construction, can be a useful material to create sturdy forms for tall perennials and supporting annual vines. Use heavy gauge wire to form a teepee-like trellis. Garden twist-ties and cable ties attach well to wires. Deadhead (remove spent flower heads) perennial flowers to keep their energy in flower production, not seed development. Pinch out the top buds of dahlias, phlox, and garden mums for bushier plants and more flowers later in the season. 4. Ornamental grasses do not need much care during this period. Most of them should be thriving right now, they should be providing beauty, movement, and texture right now. Watch soil moisture closely, and add additional mulch around the base of plants if mulch has thinned out. This keeps the roots cool and helps preserve soil moisture. 5. Early July is the last call for pruning ornamental shrubs, such as azaleas and spring flowering bushes. It is important to water shrubs that are pruned for normal recovery. Evergreen hedges are hand pruned or sheared as needed during the summer months. Boxwoods are best pruned in early spring. Prune to remove faded blooms of Knockout roses. Fertilize roses monthly until September with fertilizers such as: 10-10-10; one gallon of liquid fertilizer dilution; or fish emulsion.